Strongly influenced by DeltaWing LeMans race car. The Nissan BladeGlider's shape was strongly influenced by the DeltaWing race car. 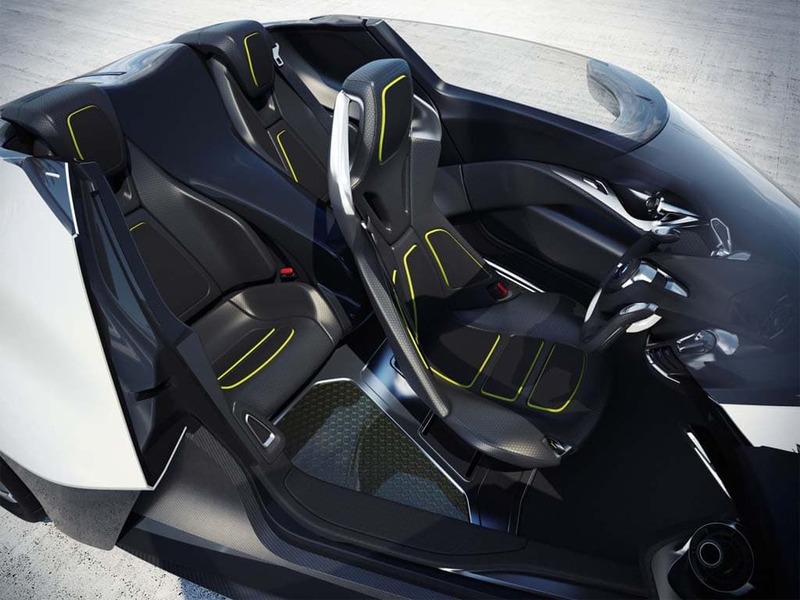 Taking its cue from the radical DeltaWing race car, Nissan plans to reveal the new deltoid-shaped BladeGlider concept vehicle at the upcoming Tokyo Motor Show – and the way the prototype gets its power is as revolutionary as the design itself. 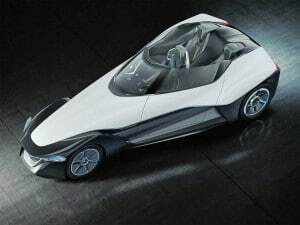 While the DeltaWing used a small but high-performance gasoline engine, the BladeGlider is all-electric. But unlike Nissan’s now-familiar Leaf battery-electric vehicle, the new concept vehicle puts power to the pavement through a pair of in-wheel motors. The rear of the Nissan BladeGlider concept is nearly twice as wide as the front. The Tokyo Motor Show has a history of providing show-goers with wild, weird and wacky concept vehicles. 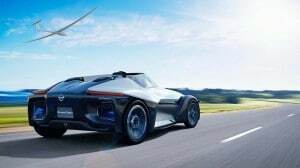 But unlike most of the prototypes unveiled at the biennial event, Nissan is broadly hinting that the BladeGlider could reappear in production form in the not-too-distant future. 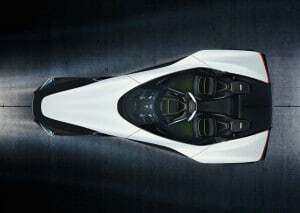 The concept vehicle’s shape, with its long, tapered nose and broad rear, immediately brings to mind a fighter jet and, in a sense, the two have much in common, as automotive designers have come to realize that improving aerodynamics can significantly reduce fuel consumption, improve performance and enhance vehicle stability, especially at high speeds. In its preliminary runs, the DeltaWing racer proved it could keep up with some of the most powerful vehicles on the Le Mans race circuit despite having a significantly smaller engine. Equally important, it used half the fuel which gave it the advantage of having to make fewer pit stops. To give perspective to the radical design, the BladeGlider measures just 3.3 feet at the front, but 5.9 feet in the rear. Like the DeltaWing, the concepts front wheels are relatively close together, though the rear tires are positioned in the more classic automotive layout. The BladeGlider's power comes from two in-wheel motors mounted in the rear. The approach might seem to defy conventional automotive logic as the BladeGlider has a 30/70 front-to-rear weight distribution, in sharp contrast to the 50/50 layout considered ideal for today’s cars. Meanwhile, the extensive use of lightweight carbon fiber reduces vehicle weight, improves the concept’s rigidity and helps sculpt a design with significant high-speed downforce. The interior is laid out in an unusual 1+2 configuration, two passengers sitting slightly to the rear of the driver. When the doors are opened, the driver’s seat swings out of the way to allow access to the rear seats. BladeGlider was penned by Ben Bowlby, who also drafted both the DeltaWing and the Zero-Emission On Demand, or ZEOD, racer Nissan will sponsor in the 2014 race at Le Mans. He was inspired by both the F14 fighter jet and the elegant shapes of high-performance gliders. “By its very nature, the DeltaWing shape with its narrow front 4-inch-wide tires, wide rear track, and downforce maximizing underbody does not need huge rear wings like other race cars to keep it planted to the road,” Bowlby explains. But Nissan’s clean sheet approach doesn’t stop with the BladeGlider’s design. The powertrain could prove just as revolutionary. The BladeGlider features an unusual, three-seat layout with the driver riding ahead of the two passengers. Instead of using an electric motor that simply replaces a conventional gasoline engine under the hood, Nissan is using twin motors, one mounted inside each of the rear wheels. That approach has a number of potential advantages. Among other things, it eliminates the need for a bulky engine compartment. It moves power directly to the wheels and makes it possible to adjust the torque coming out of each driven wheel. In turn, that makes it possible to “vector” torque to help steer through corners. The downside is that there’s more unsprung mass – or weight — in each wheel, something automotive engineers normally try to engineer out. Nissan isn’t the only automaker exploring the concept of using in-wheel motors. In fact, former General Motors tech chief Bob Purcell is CEO of Protean Motors, a start-up developing in-wheel motor technology. The concept actually first saw use, albeit in primitive form, on the very first vehicle designed by the legendary Ferdinand Porsche, more than a century ago. But Nissan hopes to be the first to use the concept in production form in a modern vehicle. Translating the BladeGlider from concept to customer could be challenging. Among other things, it will have to adapt to strict new crash standards that could prove challenging with the unusual shape of the vehicle’s nose. But Nissan seems as committed to using a delta design on the highway as it is on the track. The design of this vehicle doesn’t seem stable to me, I’m not sure if I like it at all. Poor styling/design IMO similar to the really Fugly DeltaWing race car which I can’t stand to even look at because it is so stupid.